The esplanade and the four entrances that precede the main cave of Cuatro Puertas archaeological site (source: PROYECTO TARHA). 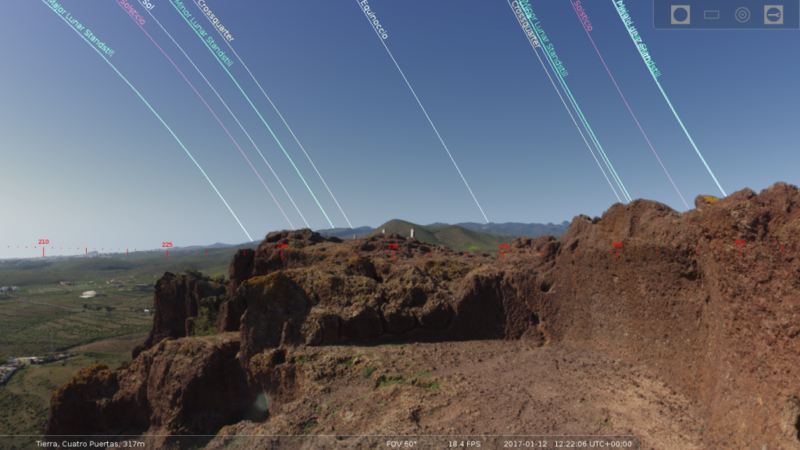 In an earlier post, we advocated the creation of a repository of Canarian landscapes of archaeological interest, for use in Stellarium. Today we want to break the ice with a landscape prepared by ourselves, corresponding to the archaeological site of Cuatro Puertas, located in Telde, Gran Canaria. This place was declared in 1972 Historical-Artistic Monument by the Spanish State –together with Cueva Pintada at Gáldar– and Property of Cultural Interest by the Government of the Canaries. 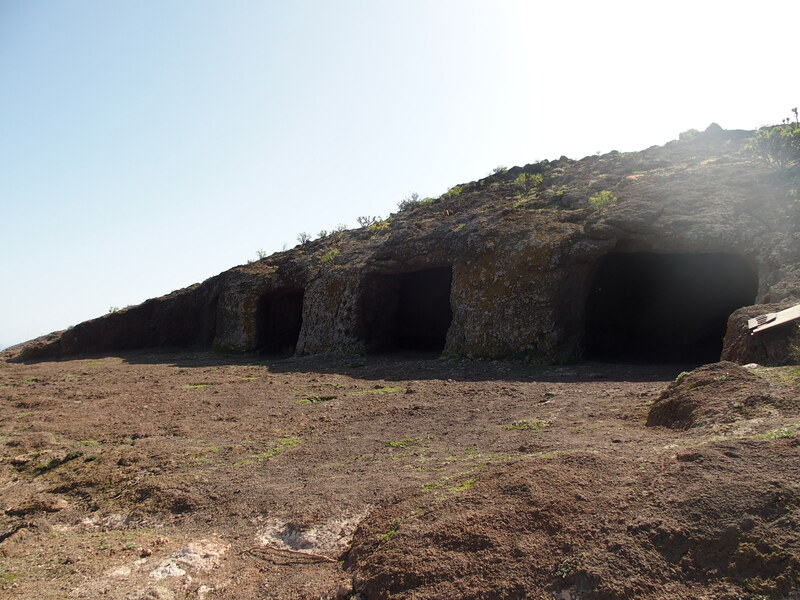 Cuatro Puertas is a set of artificial caves excavated by the ancient Canarians in an indeterminate period, although certainly before the European conquest. It is located on the top and southern face of Montaña Bermeja, a natural watchtower of little more than 300 meters of altitude on the level of the sea that offers magnificent views of the eastern country and coast of the Island, and that presents a gentle slope in its north face. On the latter, close to the summit, an artificial esplanade opens that precedes the largest cave, accessible by four striking open entrances in the volcanic tuff. This esplanade presents a set of aligned holes of shallow depth that probably were destined to support some type of porch. On the steep south slope is the rest of caves, a spectacular housing infrastructure regrettably stripped of its ornaments and furniture. However, one of the elements that most stand out in the whole is a rectangular space in the open air, carved on the top, in whose ground we find a channel in the form of a circle almost complete and perfect accompanied by some carved bowls and channels. In the remnants of the west wall a grouping of four signs is observed, incomplete by the destruction of its upper part. Also, a gap in the north wall points directly toward this cardinal point, taking as a reference the center of the aforementioned circle. 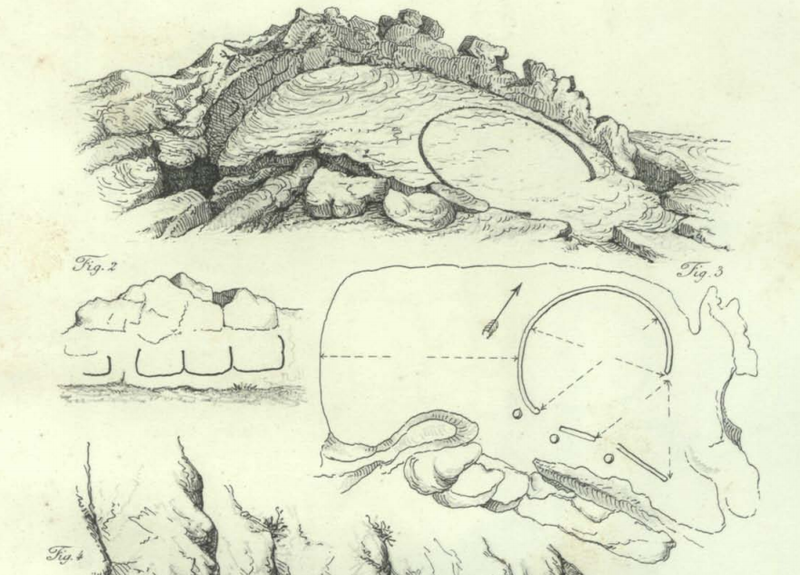 Engravings representing the platform located at the top of Cuatro Puertas, included in the work Antiquités Canariennes by French naturalist and anthropologist Sabin Berthelot (1879) (fuente: Memoria Digital de Canarias). 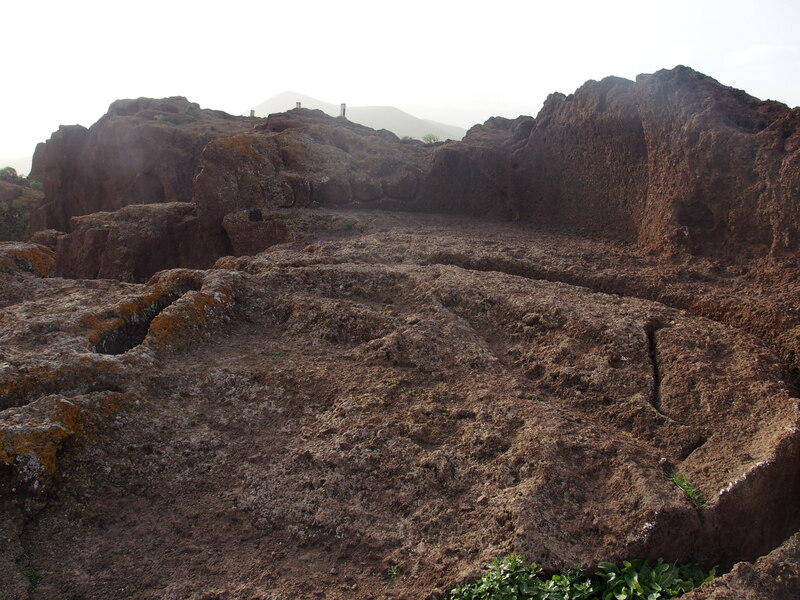 There are several hypotheses that have tried to explain the old function of this site, pointing almost all to a mixed use as a residential and magic-religious place, so that since the nineteenth century it has been called almogaren, following the designation that Grandcanarian indigenes gave to their praying houses, according to Abreu Galindo.ABREU (1848, p. 89). High-resolution orthophoto of Cuatro Puertas site. Note the enclosure that contains the carved circumference from whose center we took the images that compose our proposed landscape. At the top is the esplanade that precedes the four entrances of the main cave on which you can see the alignments of holes that were allegedly used to support the cover of the disappeared porch. Barely visible, the other housing infrastructures are inside the cliff of the lower part of the image (source: IDECanarias). 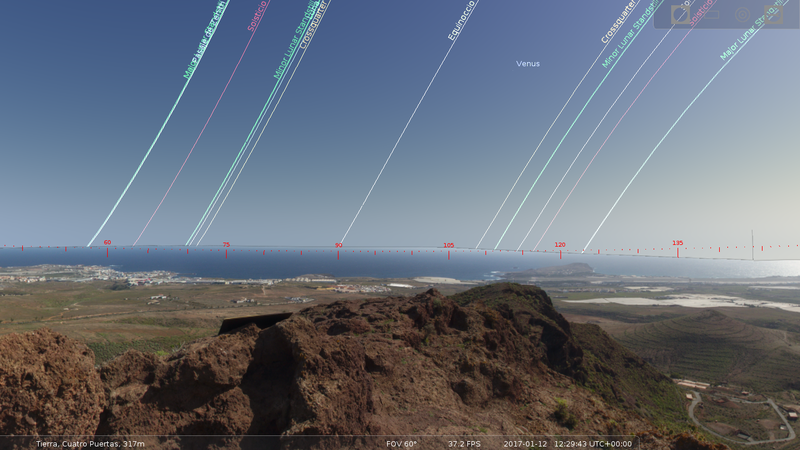 Given the archeoastronomic interest of this site, we wanted to take advantage of a personal visit to Gran Canaria to collect photographic material with which to elaborate a landscape for Stellarium. It should be noted that we did not have any previous experience, not enough time or the most appropriate material to perform this work with a high degree of quality, so the final result presents some defects that we believe do not affect in a sensible way its usefulness. Positioning ourselves in the center of the circumference excavated at the top, we took a horizontal clockwise sequence of photos spanning a 360-degree field of view, with an overlap between them of approximately 15-20% to facilitate subsequent composition. This sequence must capture the smallest possible amount of sky, since we must eliminate it during the digital post-processing phase. We used an Olympus Stylus-1 digital camera in manual mode, RAW format, ISO-100 sensitivity, minimum aperture –to get all landscape points focused– and shutter speed of 1/30 seconds. We had no tripod to stabilize the camera, so we tried to keep unwanted movement at minimum. In addition, due to the optical properties of the lens and the proximity of the stone walls, we could not incorporate the near ground –the circumference– to the photographic sequence. On the other hand, weather conditions –light dust haze– and the position of the winter sun, apart from its zenith and close to the southern horizon, caused that shots luminosity as well as the separation between the sky and the sea were somewhat irregular and/or diffuse . Detail of the carved circumference from whose center we photographed the landscape. In the background appear the four enigmatic signs cited in the text that were studied in 1985 by Professor José Barrios García (source: PROYECTO TARHA). Using a compass, applying the corresponding magnetic declination, we noted the position of the geographic north with respect to some landmark; in this case, it was a point to the left of La Isleta tombolo. In addition, we verified data collection using a digital compass application for mobile devices. Since our compasses had no visor to allow a more accurate pointing, we did not insist too much on this step. The gap opened on the north wall of the so-called almogaren on Cuatro Puertas is oriented directly toward this cardinal point from the perspective of the center of the circumference (source: PROYECTO TARHA). In our computer, we used Hugin free-software application to automatically assemble the sequence of photos as a cylindrical panorama and exported the resulting photograph in PNG format, which incorporates transparency property, useful for the next steps. 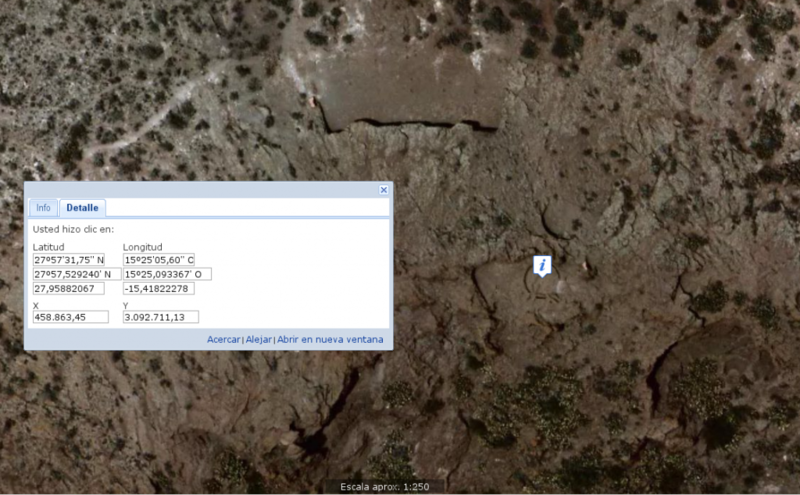 Using ArchaeoLines plugin it is easy to verify that in the summer solstice it dawns on Salinetas Beach whereas in the solstice of winter the sun leaves on the Point of Gando. Equinoxes of spring and autumn take place on Tufia settlement. These natural markers were already described in 2008 by researcher Francisco Peinado Rodríguez (source: PROYECTO TARHA). Of all the methods Stellarium allows to elaborate landscapes we chose by simplicity the so-called spherical, which uses a single photo that must keep a 2:1 aspect ratio; that is, double width than height. Since the panorama we took did not meet this restriction, we had to process it properly using GIMP photo-processing application, a free-licensed software with functions similar to those of Adobe Photoshop. Once assembled by Hugin, our panorama had a 15,482 × 1,820 pixels resolution, which obviously does not meet the 2:1 ratio. We start by not worrying about vertical resolution, which we would deal with later, and proceeded to reduce the horizontal one to a value that was a power of two.For technical reasons we won’t discuss here, these figures facilitate digital processing. In principle, it is better to choose among 8,192, 4,096, 2,048, 1,024 or 512 pixels, the better the greater, but later verifying that Stellarium would be able to handle it without trouble. making sure we keep original ratio with the chain icon. If we do it right, we will see how height changes automatically when modifying width, obtaining, in our case, a 8,192 × 963 pixels resolution image. this time though we broke the chain icon to leave the canvas width unmodified thus keeping the 8,192 horizontal pixels. Note that the canvas will be shown as a grayscale grid, indicating it is provided with transparency as it is a PNG image. 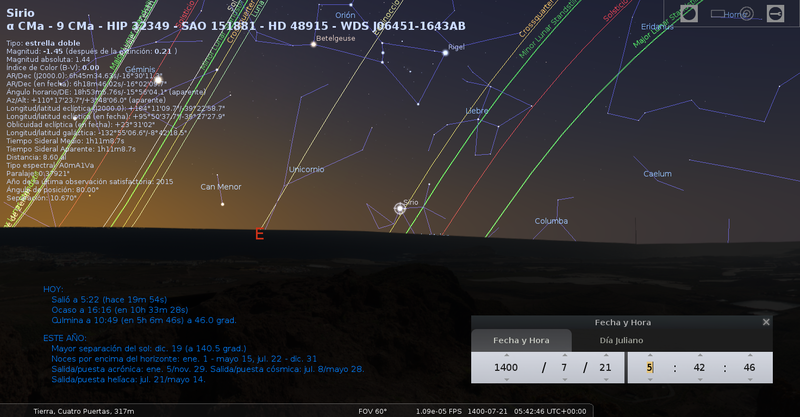 Acronycal rising of star Canopus on February 1st 1400, Candles Eve, seen from Cuatro Puertas (source: PROYECTO TARHA). In the previous step we obtained an image with a manageable resolution and a 2:1 aspect ratio by including empty parts with transparency. Then we proceed to level the panorama to make it match the horizon as much as possible, taking into account that Stellarium places it right in the middle of the full image’s vertical. Then we moved the panorama vertically until the horizon mostly matched the guide. Normally, a tradeoff must be reached because due to photographic shots’ nature, the horizon will have a more or less pronounced curvature depending on the cases. Sirius’ heliacal rising over Gando on July 21st, 1400. Sirius is the Star of the Canicular worshiped by the ancient Canarians according to Marín de Cubas (source: PROYECTO TARHA). Last stage of landscape digital post-processing consisted of removing the sky from the panorama, since Stellarium uses this space to show its own firmament. To achieve this we use the fuzzy-select tool, which automatically detects similar-color pixels, but we must make sure that its choice of areas to be removed was appropriate. The sky fragments that could not be determined automatically were removed using manual select tools –rectangles, ellipses and freehand–. Finally, we saved the resulting landscape in PNG format, explicitly indicating we wanted to keep transparency property. A readme.txt plain-text file in order to briefly explain the landscape’s context and specify our use license, among other data. A configuration file named landscape.ini. Apart from other complementary data, in the latter file we will necessarily include the geographic coordinates –latitude, longitude– and altitude above sea level of the landscape’s reference center, as well as the rotation angle of the panoramic photo that Stellarium should apply to orientate it correctly regarding the geographic north. 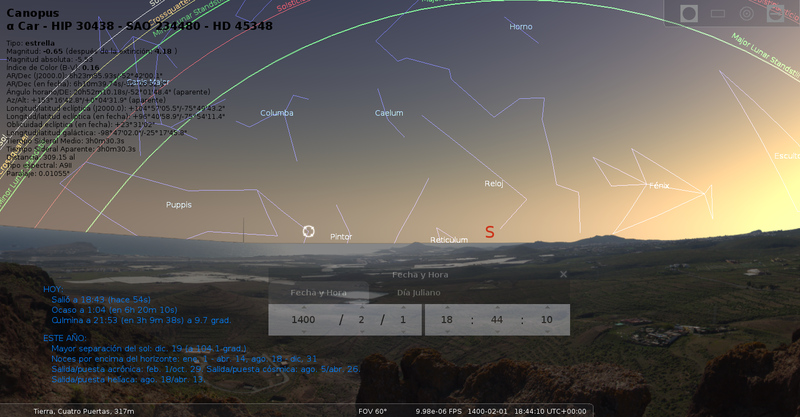 Cuatro Puertas landscape for Stellarium. Click image to download (source: PROYECTO TARHA). 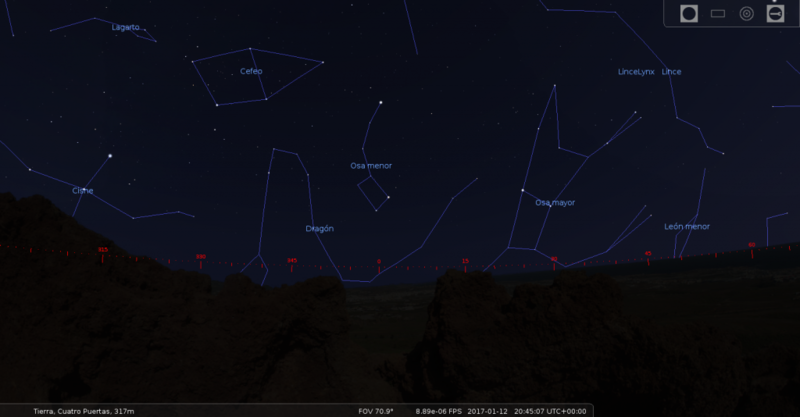 Finally, we should verify the landscape in Stellarium itself. To do this, we load the landscape into the application not forgetting to check Use location and associated planet option. The four platform signs together with ArchaeoLines plugin. These signs were studied by Professor José Barrios García in 1985 (source: PROYECTO TARHA). To note the north orientation of the gap opened in one of the walls of the enclosure. The possible use of Salinetas and Gando points as summer and winter solstitial markers, respectively, as well as the plausibility that this last enclave was taken as a reference to witness the heliacal rising of Sirius. The possible use of Tufia point as equinoctial marker and indicator of the East. Following the hypothesis by Professor Barrios García, author of a complete study on this place,BARRIOS (2004, pp. 137-146, it is possible to venture that the signs carved in the west wall depict a representation of the four gates of the Sun, markers intended to house the shadow cast by a rock illuminated by the rising sun between the spring equinox, the summer solstice and the autumn equinox, the latter interval being a period of celebration for the ancient indigenous community. As for our small contribution, we hope it will be useful and open the way to new contributions to this wonderful tool that is Stellarium. Abreu Galindo, Fr. J. de (1848). Historia de la conquista de las siete islas de Gran Canaria. Santa Cruz de Tenerife: Imprenta, Lithografía y Librería Isleña. Barrios García, J. (2004). Sistemas de numeración y calendarios de las poblaciones bereberes de Gran Canaria y Tenerife en los siglos XIV-XV. PhD. Thesis. La Laguna (Tenerife): Universidad de La Laguna. La próxima vez que vuelvas y olvides el trípode puedes llamar. Desde mi casa veo Cuatro Puertas. Buen arranque de estudio. Muchas gracias por el ofrecimiento, se tendrá en cuenta. The conquest of the Canary Islands in TV historical fiction: the cases of "Isabel" and "Conquistadores Adventum"
The Ganigo of Guadajume (1/2): A colactation pact on La Gomera?